With the holidays upon us, it's so important to shop responsibly. So much waste is produced this time of year. From plastic gifts to wrapping paper, it's literally a zero waster's nightmare. 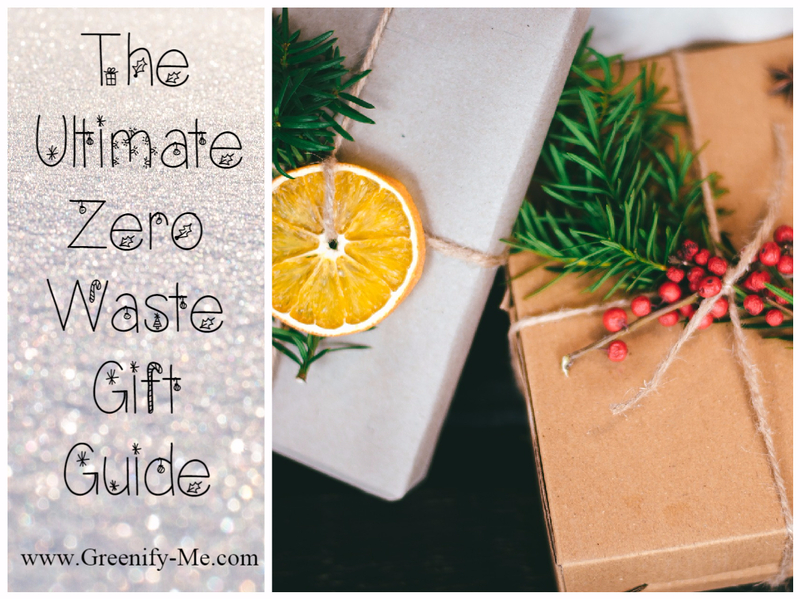 That's why I decided to create the ultimate zero waste gift guide. It will help you come up with great, sustainable gift ideas for everyone on your list. So if you're struggling to find a gift for that special someone, scroll down and see all of the options. I guarantee you'll walk away with at least one or two good ideas. And remember: This time of year can get pretty hectic. Just take a moment to slow down, breathe, and relax. Remember the reason for the season: it's not about the gifts, but the thoughts behind them! To show this, I've included both physical gifts and experience gifts in this guide. Because honestly, sometimes spending time with a person is the biggest gift you can give. Zero waste makeup: Yes, it exists. You can buy from green beauty brands that offer refills. If you've got a few bucks to spend, I highly recommend Kjaer Weis products: The quality of their makeup is top knotch and the products come encased in beautiful white bronze. All of Kjaer Weis products are refillable too *wink wink*. DIY makeup: Want to save a few bucks? Make your own makeup products instead. Here are a few tutorials on how to make lip makeup, eye makeup, and face makeup. Reusable cotton or hemp rounds: You can create your own or buy some (Etsy sells a ton of them). Plaine Products subscription: Check out my review of this amazing plastic-free brand here. They sell shampoo, conditioner, body wash, hand wash and body lotion, all in refillable aluminum bottles. Reusable facial wash cloths: Perfect for removing makeup at night or wiping your face after cleansing it. You can make these yourself or buy some. Plastic-free hair ties: My favorite is Lila's colorful organic cotton hair ties. They're made with only organic cotton, natural rubber, and hand dyed in 5 different colors. Wooden hair brush: Who needs plastic brushes when a wooden brush is so much better? Wooden brushes are much sturdier, making them much more durable (and less likely to break). Natural perfume: You can buy it or make it (solid perfumes are easy to make, but so are plant perfumes). Either way, it beats the ones with artificial scents every time. DIY skincare: Who wouldn't want some DIY skincare goodies? You can make anything: body scrub and body lotion, bath salts and soaks, bath bombs and bubble baths, facial serums and face masks. Get creative! Green Spa treatment: Give the gift of ordering your loved one a spa treatment. Even better, try to find a local spa that's sustainable and uses natural products. Just google "green spas near me" or "natural spas", then your state. You might be surprised at what comes up. One of my local favorites is The Secret Garden Spa and Salon (located in Staten Island, New York). DIY haircare: There are so many ways to make DIY haircare products. Here are a few to get your brain pumping: Hair volumizers and highlighters, herbal hair teas, dry shampoo, and herbal shampoo and conditioner. Let these DIYs inspire you to craft your own super unique gift. Reusable water bottle: When you're constantly on the go, you certainly need something to drink. A reusable water bottle is perfect for this. Better yet, make it a stainless steel one: It's great at keeping liquids hot or cold for long periods of time. Reusable cutlery: Lets face it, on the go, you're bound to run into the dreaded plastic fork or spoon. Help your loved ones avoid this by getting them some reusable cutlery. Handkerchief: Sometimes, you just need to sneeze. Help your loved ones avoid single-use tissues by getting them a handkerchief. You can also get them a pack of hanky tissues which are really cute and easy to transport in a bag or purse. Cloth napkins: Easy to buy or make yourself. Etsy sells a ton of really cute ones, or you can just make some from old cloth you have lying around (ex: Old flannel T-shirts, old kitchen towels, etc.). These are perfect for on the go people because they fit nicely in bags. Reusable bag(s): When you're on the go, you need a bag to get you through it. Give your loved ones a reusable tote bag, produce bag (M - L), and/or a reusable shopping bag. They're bound to appreciate it no matter where they go. Travel mug: Know someone who cannot live without their coffee or tea in the morning? Get them a reusable travel mug. There are tons of beautiful travel mugs available on Etsy. Personally, I have a stainless steel one, but ceramic ones are beautiful too. An experience: If you have an adventurer on your hands, wouldn't it be fitting to give them an adventure? Take them somewhere awesome like to a play, movie, park, or museum. Get them tickets to their favorite sporting event, plan a trip with them, surprise them with tickets to a cruise. Think of something that will wow them and get them out of the house. Can't think of anything good? Check out Experience Days: You can find almost any kind of experience gift near you on that website. A bike: If you really want to go all out for someone, consider buying them a bike. Biking to school, work, or to a friend's house produces a lot less waste than taking a car. In fact, it produces close to zero (unless we're talking motorcycle bikes). Check out your local bike store, or better yet, buy a sustainably made bicycle. Reusable shopping bags: When you first start out living a zero waste lifestyle, a reusable shopping bag is an essential you can not be without. Produce bags: Either drawstring, crocheted, or upcycled produce bags (M - L) will do. Just as long as they help your loved one avoid those single-use plastic bags most produce gets put in. Safety razor: Swapping out the plastic disposable razors is an important part of going zero waste. Make it easy for them by getting them a safety razor (long handled or standard). Reusable straws: Glass, stainless steel, bamboo - whatever form your straws take, it better not be plastic. Get them some reusable ones that will last a lifetime. Bamboo toothbrushes: This is a must for any zero waster. Plus, bamboo toothbrushes are compostable! Collection of mason jars: Always appreciated, since they can be used for so much - crafts, canning, storage, leftovers, etc. You name it, and a mason jar can probably do it. Zero waste shower essentials: This includes a soap bar, shampoo/conditioner bar (or a Plaine Products subscription), safety razor, wooden brush, etc. Wax-wrap or bowl covers: Something to get rid of the dreaded plastic wrap! Wax-wrap or cloth bowl covers work well and you can DIY them or buy them. Cutlery wrap (or multi-utensil kit): This can be made by hand, or bought. I personally use StrawSleeves' multi-utensil pack. Read my review of StrawSleeves here. Reusable water bottle (and/or travel mug): They're going to need something to carry their drinkable liquids in. Might as well be reusable too! Cloth diapers: Depending on how old the children are, you might want to get them some cloth diapers (S, M, L). That, or find some compostable diapers. Experience gift: If the child is old enough, get them an experience gift they can share with their parent (or a friend). Tickets to concerts, theaters, and art classes work well. Homemade clothes: Babies go through a lot of clothes - if you're any good at knitting or crocheting, try your hand at making some socks, booties, sweaters, and blankets. Sustainable toys: Try buying wooden toys, or toys made from recycled plastic. I've noticed Barnes and Noble sells some toys made from recycled plastic. This is a good place to start, but generally speaking, avoid buying too much plastic (even if it is recycled). You can also try your hand at making homemade crayons. Fun kits: Try buying them a science, art, knitting, sewing, or crocheting kit. When I was younger, I got an art kit complete with crayons, colored pencils, erasers and paper. It kept me busy for hours and I still have it to this day! E-books or secondhand books: If you know a little one that loves reading, encourage them to do so by buying an e-book or secondhand book for them. You can find secondhand books at vintage shops: Just make sure they're in good condition before purchase. Library membership: What can beat a library membership? Literally, you're giving a child access to an unlimited resource of books and knowledge. All for free! Secondhand kids clothes: If you can't make your own clothes for kids (or they're simply too big for that), try buying secondhand clothes. Make sure they're in good condition before doing so. You might be able to find some good deals in vintage stores too. Yoga retreat/class: Have a friend or family member who loves yoga? Look into local yoga instructors near you who offer classes, events, and retreats. You can purchase a ticket for your loved one. Wellness events: Take your loved one to a wellness event happening near you. You might be surprised at what's going on in your area. A quick google search should help. Depending on what you're looking for, make sure to specify the region you're in. Public speaking events: Know a specific wellness advocate who's going to be doing some public speaking? Know your loved one would want to go? Get tickets to go see it (for just them, or the two of you!). You can also do a little digging to find out who their favorite wellness authors are and see if they're making any public appearances soon. Aromatherapy: Try buying them some essential oils. If they already have essential oils, why not get them a diffuser? You can find some really nice diffusers/humidifiers on Etsy. For a fun little twist, why not get them a diffuser necklace/earrings? Visit a psychic: Are they spiritual? Like psychics? Take them to get their cards or tea leaves read. If nothing else, it's definitely different and fun. Buy them crystals: Crystals are beautiful, and just looking at them is enough to calm a person down. However, there are crystals that possess certain properties (or at least claim to). This can certainly help with wellness and promoting a healthy state of mind. Some crystals worth looking into are: Amethyst, aura quartz, clear quartz, rose quartz, turquoise, and jasper. Order them a massage: Looking for the perfect pampering experience? Get your loved one a massage package. A lot of salons offer these - you just have to do a little digging. If the loved one you're gifting it to is married, you can even place an order for two people. Visit a botanical garden together: Nothing is better for the soul than nature! Botanical gardens have an abundance of beautiful plants in them. If your friend or family member is stressed out, they'll surely appreciate an experience gift like this. Buy them their favorite tea: Tea is so good for you - do they have a favorite brand? If so, splurge and get them a slew of tea from that brand. Most tea bags are compostable. If you're worried they won't be, try buying them some tea in bulk, or looking for compostable tea bags. Yogi tea has compostable tea bags and uses cardboard to package the tea bags in. Secondhand books (on wellness): Buy them some secondhand books featuring topics in wellness they love. It's hard to go wrong. Treat them out to dinner: Better yet, make it their favorite low-waste restaurant. If you can't find any low-waste restaurants around you, at least go somewhere they have organic food options. Take them to a wine/beer tasting: Even better, find a local wine/beer tasting near you. See if there are any local breweries by typing in your state and "wine/beer tasting" to google. Baked goods: To make sure these are as fresh as can be, make them yourself, or get them from the farmers market. Homemade kombucha: If they love kombucha, that is. Canned goods: Can't go wrong with making some delicious canned goods! Give them homemade jams, pickles, curry pastes, condiments and more. Flask or shaker: Know someone who likes to drink? Get them a flask or shaker (double points if it's stainless steel). Stainless steel ice cube tray: So many ice cube trays are made out of plastic. When did that become a thing? Switch it up by getting someone close to you a stainless steel ice cube tray. Gourmet bulk foods: Who wouldn't love some gourmet honey, artisian chocolates, or charcuterie? Bulk olive oils: If you know someone who likes to try as many new items in the kitchen as possible, get them some fancy bulk olive oils. Just make sure it's all in glass packaging! Assorted spices: Help your loved one spice things up a bit with assorted spices. Here's a nice pantry kit of 24 filled spice jars. Stainless steel cooking essentials: Pots and pans, especially a beautiful stainless steel set, are always appreciated by a foodie. Did this guide help you? Leave your favorite zero waste gift ideas below to make this an even better resource!